Sometimes you just need a little sparkle in your day... 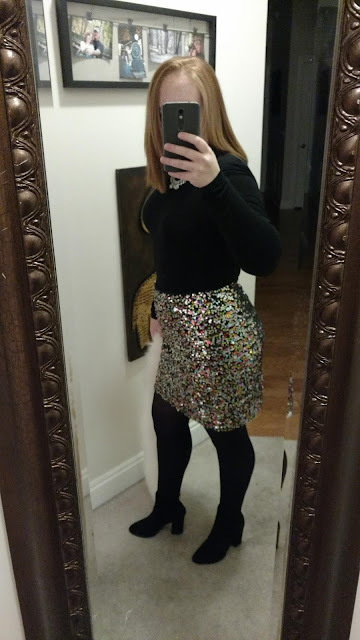 I couldn't resist this skirt from H&M. They're sold out in this multi-colored one, but they still have black and red (and they're on sale!). 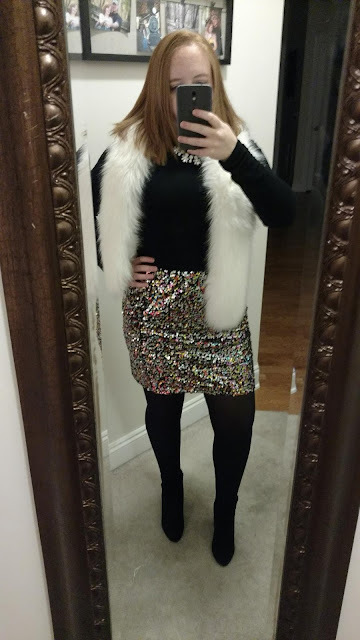 I picked up this faux fur stole during a last-minute Christmas shopping trip to Target. Alexis loves it, too! It's on clearance now and comes in three other colors. The turtleneck I've had since last year, but it's such a good staple that Old Navy keeps bringing it back. It's available in several colors and under $20. The boots are recent but getting low on stock in the black. There are several other colors to choose from though. You look sensational in that sparkly skirt! I can understand why Alexis is drawn to it. The turtleneck and boots complement the outfit nicely. I appreciated your visit to SDMM as we begin a new year. You are my oldest friend in blogging and it makes me happy that we still stay in touch year after year. An important announcement and a big surprise are coming up on my blog in the middle of the year and I hope you will be on hand for it. I wish you and your family all the best in 2018, dear friend Ashton, especially that dear little girl of yours. Stay well and thanks again for your friendship and support!